Alejandra has lived in the United States since she was a baby. She grew up with her mother and brother, who are both U.S. citizens. As a young person living in Arizona, Alejandra was arrested and convicted of several charges, including driving under the influence and possession of drug paraphernalia, some of which were felonies under state law. In 2011, after she complied with court orders for her arrests, she was detained by Immigration and Customs Enforcement (ICE) and spent 2 years at the Eloy Detention Center in Southern Arizona, lost her residency, and was placed in deportation proceedings. After being released from detention in 2013, Alejandra began to advocate for human and civil rights, dedicating her life to organizing for reproductive justice and the rights of immigrants. In January 2018, Pablos was leading chants at a peaceful protest in Virginia outside of the Department of Homeland Security (DHS), when she was singled out and detained by DHS agents. This arrest was a result of her work as a human rights defender, which does not pose any risk to public safety. Although she was released from jail and all charges against her stemming from this arrest have since been dropped, this flagged her case for ICE. On March 07, 2018, when Pablos showed up for her check-in with Immigration and Customs Enforcement (ICE) in Tucson, she was taken into custody. Ale was held at the Eloy Detention Center in southern Arizona awaiting a bond hearing for 42 days. 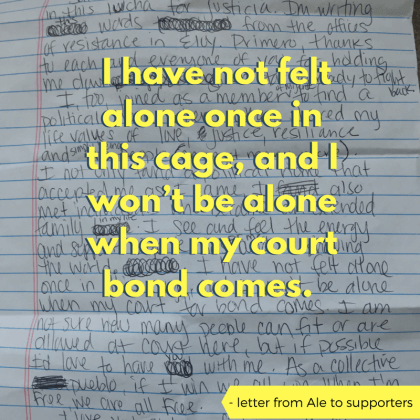 The same day she was detained, Ale’s supporters started gathering letters of support and petition signatures. They quickly gathered over 20,000 signatures demanding her release. On April 19th, 2018 Alejandra had an immigration bond hearing in Eloy, AZ. Thanks to the overwhelming amount of community support, aa federal immigration judge a declared Alejandra was eligible to be released on a bond of $8,000 and was allowed to go home with her family. She was released later that day. Although no longer in custody, Alejandra still has to continue to fight her deportation case. Her individual asylum hearing is scheduled for December 11, 2018 in Tucson, Arizona. Alejandra’s immigration case is complicated in part because of prior criminal history. If AZ Governor Ducey were to pardon Alejandra for the charges from a decade ago, she would have a chance to fight to remain home in the US with her family and community. Alejandra is yet another name added to the growing list of immigrant rights and human rights defenders in the United States who have been targeted by ICE for deportation. Mar 9, 2018: The day she is detained, Ale calls for community members to fight for her as she fights for her release from the inside. April 19, 2018: Ale with Mijente members after being released from Eloy Detention Center.